The meeting between President Tsai and a British parliamentary delegation on the 3rd of August in Taipei was full of enthusiastic talk. Taiwan voiced its willingness to increase cooperation with the UK through a free trade agreement or bilateral investment agreement. But how likely is it that such enthusiasms will give rise to more trade, investment and cultural exchanges? The reigning instabilities lie in the global economy, in the strategies of Chinese economic growth and relations with Taiwan and the US, in British politico-economic vacillations, and in the degree of determination of the DPP to stick to its guns on loosening commercial ties with mainland China. Nothing much easy in all of that! In addition, the politico-economic shifts of the global system since 2008 really do alter a lot of bilateral game plans. The years since 2006-8 were not merely ones of small growth. Global recession has been associated with the quicker replacement of an old class-based industrial democratic conglomerate by the politics of identity, client-ism, the rapid rise of new rich groups associated with no real local or national identities, who readily dodge or disobey the regulations of democracy, the new politics of social movement technology, which also dodges normal democratic process (obviously witnessed in the Sunflower movement), and the abysmal world of terrorism. Scepticism only mounts when we look at more specific issues. Britain is fishing for both substantial and nominal alternatives to the European Community membership in this lengthy Brexit melodrama dominant in domestic policies. The nature of the commercial sector in Britain is very difficult to formulate for these few years. A noisy flux of proposals will be forthcoming from the Tories to both appease the Brexiteers and stop the flow of supportive interest that has been directed at the Labour Party since Corbyn’s clever election manifesto. The Bank of England figures now show that wage growth is not keeping up with inflation, spelling some fall in real incomes and a near future of a fall in consumption and some rise in interest rates. So, when we are to consider UK-Taiwan-China it must be within this new world of nuance and complexity, which would be of such a character even in the absence of Brexit and Trump. More brutally, why would the inheritors of 2008 in China spend much of their time wondering about unemployed steel workers in the UK? Beyond their own health requirements, why should they be so very considerate of carbon dioxide emissions that ruin health in the West? I am serious here. Anyone of my age who is Chinese has lived through a childhood pestered, blighted, and burdened by an array of earlier machinations stemming from the Great Powers of the old world; they have faced the devastations of a Maoism that rode on the back of an understandable anti-Westernism; many of them (perhaps 300 million) are now demonstrably benefitting from a newer process of capitalistic economic expansion that does not necessarily align with existing democratic institutions. We might well argue that the juxtaposition of proto-capitalist economic growth with rightest Communism in the political system cannot last forever. We are probably correct, but it lasted since 1978. Outside of the EU, the UK might benefit from a very open, free-trade relationship with China across high-tech, middle-class consumer areas, which when accumulated can add up to a very high proportion of the British economy’s exporting capability. Any deals that gave knowledge access to Chinese business might be a better bet than huge infrastructural projects. On the other hand, it might be worth considering UK supplies of infrastructure engineering equipment into such large projects, possibly leading back to the high-tech exports argument. 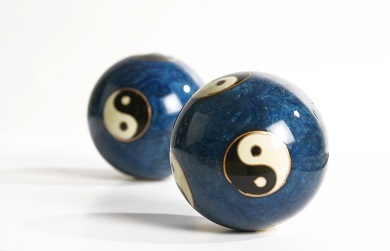 On the import side, if an infrastructural-based surge into the Chinese inner provinces is to take place that might lead to far more energy development in China and future exports of Chinese coal, oil and metals, including a large variety of rare earths and metals. Whether in less than the very long term China will be open to importation of London’s financial services and expertise is a guess, but unlikely. Recent history does not give clear guidelines for the immediate future of commercial relations between Britain and Taiwan. On some measures things look healthy enough – Taiwan ranks as Britain’s sixth trading partner in the Asia-Pacific (behind China, Japan, Hong Kong, South Korea and Singapore). But, to put things in perspective, first imagine who might be sixth if it were not Taiwan, and then consider that Taiwan ranks below 30 in the global list of British trading partners. In contrast, Britain ranks 13th globally as an importer of Taiwanese goods and services. Some 68% of Taiwanese investment in Europe is in Britain. At a time when Britain is looking for new trading deals globally, when Taiwan seems committed – more or less – to diversification of trade from China to a wider mix of nations, and when the global economy is hardly thriving under the potentially restrictive trading regime called for by US President Donald Trump, a good longer-term tactic for Taiwan may well be to foster the British relationship, which in terms of comparative advantage appears to be mildly in Taiwan’s favour. Whether we see present relations between the UK and Taiwan optimistically or not, seeing through the confusions of a Trumpian globe requires a telescope plus foresight. If Trump continues with rhetorical fluff then finds himself in budgetary mire, it might be that Britain would become a very well placed, English-language base for Chinese development of commercial and soft-power relations with the rest of the world. It remains a moot point as to whether Taiwan-UK relations would benefit. But the danger is that Taiwan might well be pushed further from the limelight of British strategic thinking. Indeed, a goodly proportion of the consumer products UK might ship to China compete directly with potential Taiwanese exports to China. Ian Inkster is a Professorial Research Associate Centre of Taiwan Studies, SOAS, London; a Senior Fellow at the Taiwan Studies Programme and China Policy Institute at the University of Nottingham and editor of History of Technology (London) since 2001. 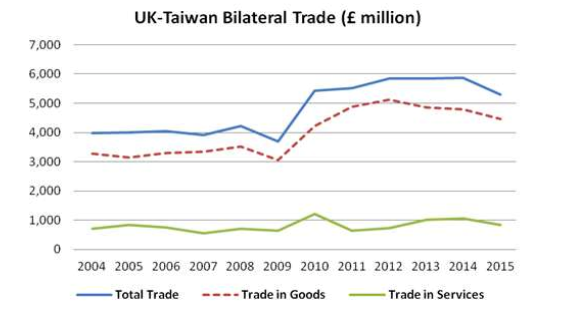 Economic data used in this article can be found in the 2016 UK-Taiwan Bilateral Trade Report. Image credit: CC by Office of the President of the Republic of China (Taiwan)/Flickr.